← Should Locog get more people jogging? As the nights draw in and the weather worsens, the glowing summer of sport already seems a long time ago. The video montages will display the headlines and big names but – like no British summer before it – the last four months will have left every spectator with their own set of personal memories. I’ve spent some of the summer working and some of it as a fan in the stands, cheering for Great Britain and many of the athletes I’ve encountered over the last few years. Here are my personal highlights – please let me know about yours. Over 170 of Great Britain’s rowing Olympians, going back as far as 1948, attended the final day of Henley Royal Regatta – and it can be pretty disconcerting when the scruffy bloke you’ve been working with all week introduces himself to someone else as Britain’s oldest living Olympic rowing champion – but the focus of the week was on the future as none of the Brits bound for 2012, and very few from other nations, competed over London’s last Olympic rowing course. The latest group invited to the Henley party were schoolgirls, competing in quads for the first time and surprising some with their quality. Henley RC won the inaugural title and dealt with the media attention like professionals. Also determined to look to the future was Alex Woods, the Oxford oarsman who collapsed from exhaustion during April’s controversial Boat Race. His crew weren’t successful but it was good to see him back in action. As reporter for the regatta’s news service it was also lots of fun talking to those around the boat tents, asking rowers and coaches about their secrets of success. The view on TV may be better but Tour de France is best experienced after a lengthy road trip and a few hours by the side of the course. A time trial at least lengthens the experience but Bradley Wiggins still ascended the final hill through Chartres in a flash, before punching the air at the finish to acknowledge finally that he would be the first Brit ever to win the Tour de France. 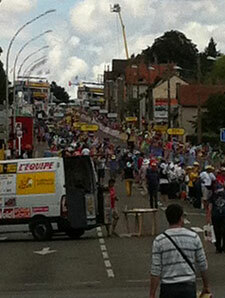 Lacking a big screen, I was struggling to remember schoolboy French while listening to the announcer at roadside. Surely he had not just announced Wiggins as 53 seconds ahead of any other rider at the second time-check, two-thirds of the way into the course. He was, and he won by 73. A day after Wiggins and GB’s men proved unable to deliver Mark Cavendish first to the finish line in the Mall, Lizzie Armitstead came much closer in a classic sprint with Dutch great Marianne Vos. Soaked to the skin while on Box Hill, a large crowd made it to a local vineyard in time to watch on a big screen, joining the 7.6m people who watched on TV as the duo made a mockery of suggestions from some quarters that women’s road racing is more boring than the men’s version. After taking silver, Armitstead touched on the debate that has appeared on this blog in the past, and world governing body the UCI recently approved a plan to promote women’s cycling more heavily. If you want to get involved, follow the Twitter hastag #FanBackedWomensTeam. Dorney Lake was transformed during the Olympics into a cauldron of noise and Great Britain’s rowers played their part by topping the medal table. Women’s rowing has only been part of Olympics since 1976, their events have only been rowed over the full 2km course since ’88 and Great Britain only won their first womens’s medal in 2000. Twelve years later, they won their first gold, and two more for good measure. Helen Glover and Heather Stanning kicked things off with gold in the pair, Katherine Grainger and Anna Watkins ended Grainger’s 12 years of hurt in the double scull then lightweights Sophie Hosking and Kat Copeland crashed the party too. Despite the tremendous physical effort required in the race, sometimes it looks easy when you watch from the towpath, but Glover gave an insight into the sacrifice required when she told me about a time before funding kicked in when she was unable to afford petrol and had to run between work and training. A week later, the women’s squad’s Aussie head coach Paul Thompson was still smiling broadly and tremendously proud. There were also two brave bronze medals, from GB’s men’s eight and from Alan Campbell in the single scull. As a junior, Matt Langridge from the eight once told his coach that silver was for first loser; his crew personified that attitude with a gold-or-bust approach desperate to take the title from Germany ending in exhaustion. The race also brought an end to Greg Searle’s storied comeback. If anyone else was lucky enough to see Great Britain’s first gold of both the 2012 Olympics and Paralympics, I would love to hear from them. Sarah Storey brought the first bling at the Paralympics, winning the individual pursuit on the track with a display of dominance she would repeat three further times, becoming in the process Britain’s most decorated Paralympian of the modern era. Arguably the memory that will live longest from the Paralympic velodrome, though, was the sight of Jody Cundy exploding after being denied the chance to ride for gold in the 1km time trial. It banished any suggestion that Paralympic sport was purely about participation; it was never more clearly about competition at the highest level. Wheelchair rugby, originally known as “murderball” because of its regular bashing and crashing, with Great Britain’s mohawked attacked David Anthony. Wheelchair basketball, in which a British side including charismatic veterans Terry Bywater and Jon Pollock suffered a heart-breaking bronze-medal match defeat to the United States. Goalball, where crowds at the Copper Box arena had to be quiet during play so that visually impaired competitors could hear the bells in the ball. Known during the Olympics as the Box that Rocks, the venue became the Box without Vox. Events in the athletics stadium that included the high jump for leg amputees, a fact you struggle to take in as competitors ditch their crutches shortly before leaping over the bar. The Prime Minister heralded the end of a “golden summer of sport” at the athletes’ parade in London on the day after the Paralympics finished, but Mark Cavendish was determined to make it last one more week. Marginalised by Team Sky and unable to capture Olympic gold despite the efforts of his team, he capped his season with victory in an uphill sprint over the cobbles of Guildford High Street to win the final stage of the Tour of Britain. He was watched by thousands, with crowds eight or 10 deep on that final hill having to be content with screaming at the big screen after seeing the riders flicker by through a mass of bodies. The other star that day was Jonathan Tiernan-Locke, winner of the Tour overall, before making an impressive senior debut for GB at the world championships in the Netherlands to mark him out as one for the future. The summer of British sport may be over but the sports themselves never stop evolving. Those are my personal highlights from the sports that hit the headlines in 2012. Please let me know about your favourite bits – there is so much to chose from. My real summer highs, though, came from the performances of the rowers I coached over the season. I don’t blog or write about them because I think doing so would compromise the coach-athlete relationship, and because they haven’t grabbed any headlines, yet at least. That’s why I am about to start doing far more coaching than writing, hoping to play a part in more sporting highlights to come. 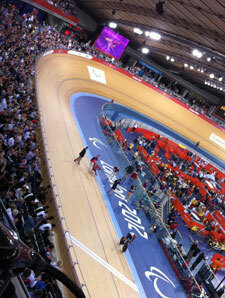 This entry was posted in athletics, cycling, olympics, paralympics, rowing, wheelchair sport, women's sport. Bookmark the permalink. What’s The Rowlup all about? What was your #rowingmoment2012 ?